Many online stores offer a free shipping for big orders. Let's assume you do that too for orders starting with $130 subtotal to drive your customers buy more. That's what can be easily done with Tree Table Rate Shipping. By the way, it's the right time to change Label for the rule you were editing previously to something more meaningful than a random fruit name. Name it for example Default weight rate. After that collapse rule settings by clicking to its header again since we are not going to edit them in this step. Getting back to the original goal create a new rule like you did before. Expand its settings and name it Free for $130+. Go to the Conditions section and add a condition with the appropriate button. Choose Price, ≥ and type in 130 to the input field. That means that the rule will only be in effect when the condition is met, i.e. when total order price (subtotal) is $130 or more. 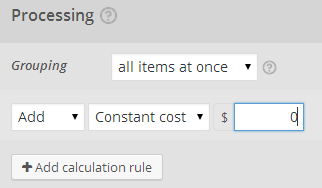 Go to the Processing section, add a calculation, choose Add, Constant cost and type in 0 in the input field. We need to do that because rules having no calculations are skipped. Now we need to move new rule before the previous one. To do that collapse current rule settings by clicking on its head and drag'n'drop it to the first place. Save settings and go to the cart page. Refresh it and you will see nothing changed. That's right since order subtotal is less than $130. 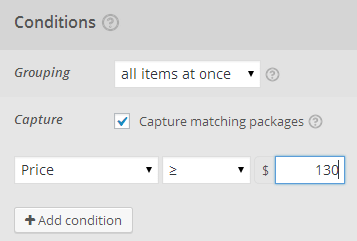 Increase item quantity to get subtotal to above $130 and click Update Cart. Now you should notice the delivery option title changed to Tree Table Rate (Free). That's what we need. How that works? When an order is getting passed through the set of the shipping rules it's checked against each rule's conditions. If it meets all the rule conditions it gets "captured" by this rule, i.e. it's not passed to the next sibling rule. That's why you didn't see any changes on first checkout page refresh, because order was not matching the conditions of Free for $130+ rule. And it was passed to the next rule Default weight rate which does not have any condition and therefore matches any order. Upon second refresh, after adding more quantity, you saw first rule in effect. The entire order was captured by this rule and did not get to the second one. In the next step we will deal with international shipping. 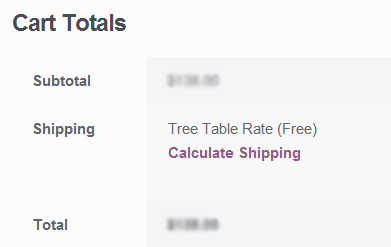 © 2019 Tree Table Rate Shipping for WooCommerce. A license entitles you to one year of automatic updates and support for a single production store. A number of test/staging stores is not limited. Full refund within 14 days after purchase if the plugin is not suitable for you. Plugin requires PHP 5.3+, WordPress 4.0+, WooCommerce 2.6+. You will receive a confirmation email with a download link in a few minutes after purchasing. By proceeding, you agree to the Terms & Conditions. You will receive a confirmation email with your download link in a few minutes.